The map is divided into four areas with two players in each area. Also there is a high ground in the center of the map with plenty of trees and a great strategic point. 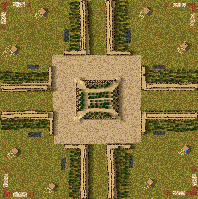 why is this map a stronghold crusader map? is it supposed to be played in a mod called stronghold: Europe?